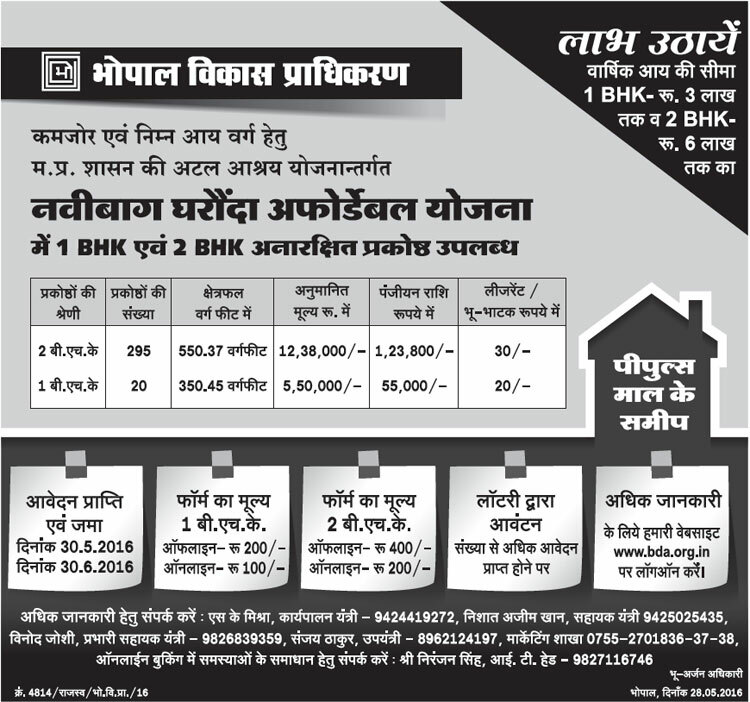 Bhopal Development Authority has come up with a new housing scheme under Atal Ashraya Yojana named as BDA Navibagh Gharonda Affordable Housing Scheme 2016. In this scheme, the authority invites applications from economical weaker section and lower income group of the society for the allotment of 315 houses. Under the scheme, majority of 295 housing units are 2BHK and only 20 units are 1BHK. Registrations for the scheme has been started from today 30 May 2016 the scheme will be closed on 30 June 2016. Applications for flat in the scheme are being offered through both online and offline mode in the registration period. The authority has offering 1BHK and 2BHK houses having an area of 350.45 square feet and 550.37 square feet respectively. The cost of 2BHK unit is around Rs. 12,38,00/- while the 1BHK unit is available at the estimated cost of Rs. 5,50,000/-. How to Apply: Application form for the scheme can be filled through offline or online mode within the registration period. For offline registration, the cost of application form is Rs. 200/- and Rs. 400/- for 1BHK and 2BHK respectively. While in case of online registration, the applicant will have to pay only Rs. 100/- fro 1BHK and Rs. 200/- for 2BHK houses. The online application can be filled through official website of BDA Bhopal. For 1BHK flat, the applicant should not have annual income more than Rs. 3 lakh. For 2BHK flat, the applicant should not have annual income more than Rs. 6 lakh. For more information visit the official website of Bhopal Development Authority.